The Super Bowl is once again upon us! Whether you’re a huge sports fan or a connoisseur of commercials (like us), there is one unifying thing at any good Super Bowl party, the food. Last year we shared a couple recipes with you. This year however, we really wanted to share some recipes that will bring the geek to your Super Bowl party. All the Meats Sliders– BBQ is always a sure fire thing at a Super Bowl Party as it reminds your guests of tailgating! 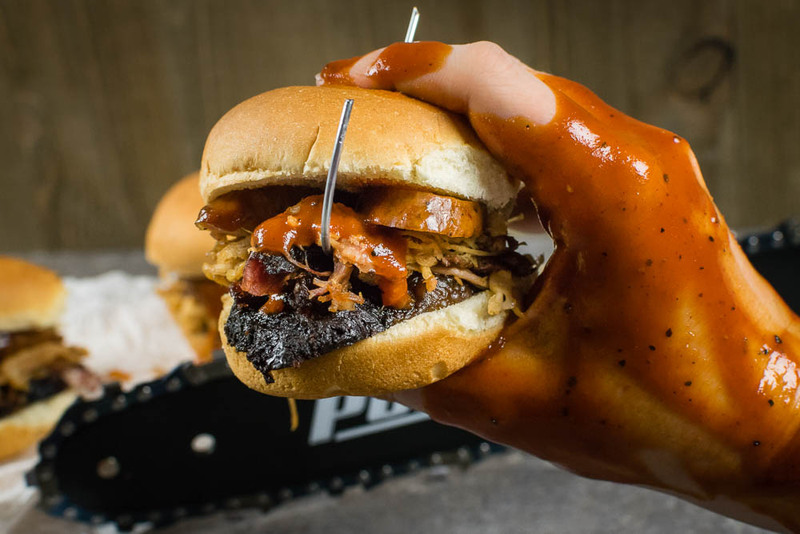 These sliders inspired by Leatherface are jam packed with delicious smoked meat and smoky bbq sauce. Aquaman’s Lobster Cups– Looking for something a little lighter? 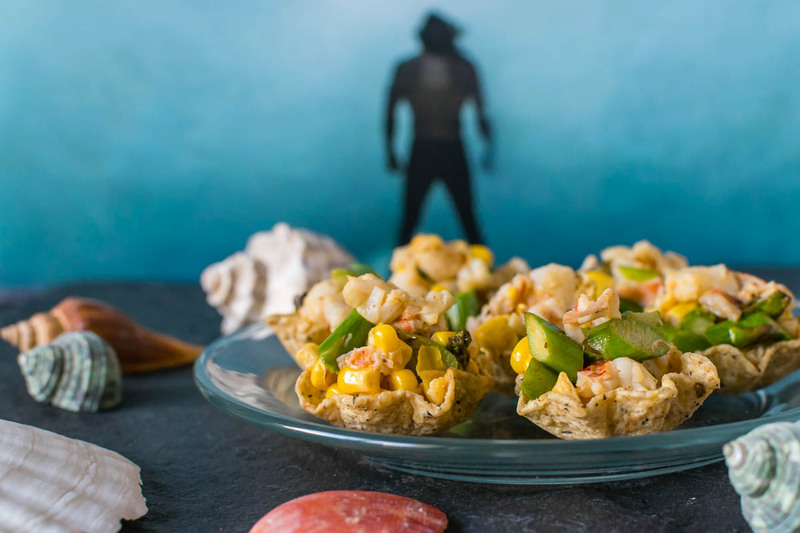 Our Aquaman’s Lobster Cups recipe has a great balance of texture and bright flavor. 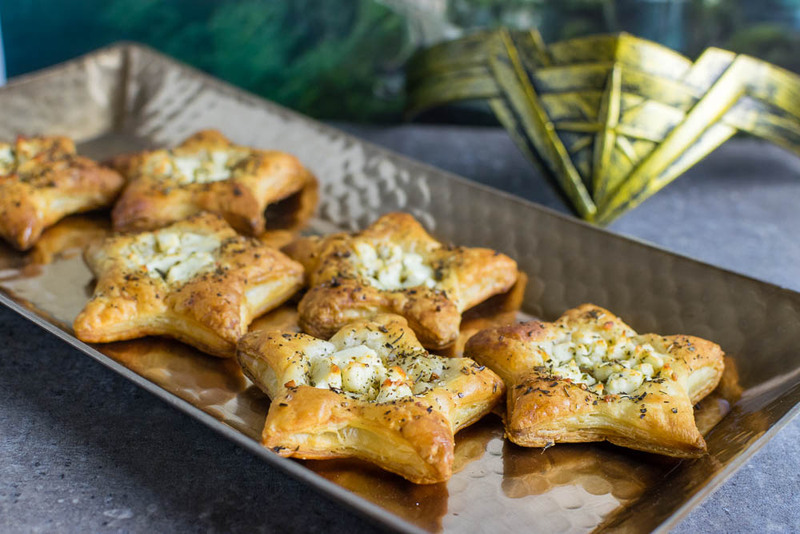 Feta and Puff Pastry Stars– We love puff pastry! It is easy to make a stunning looking appetizer with very little effort. These Feta and Puff Pastry Stars are no exception! 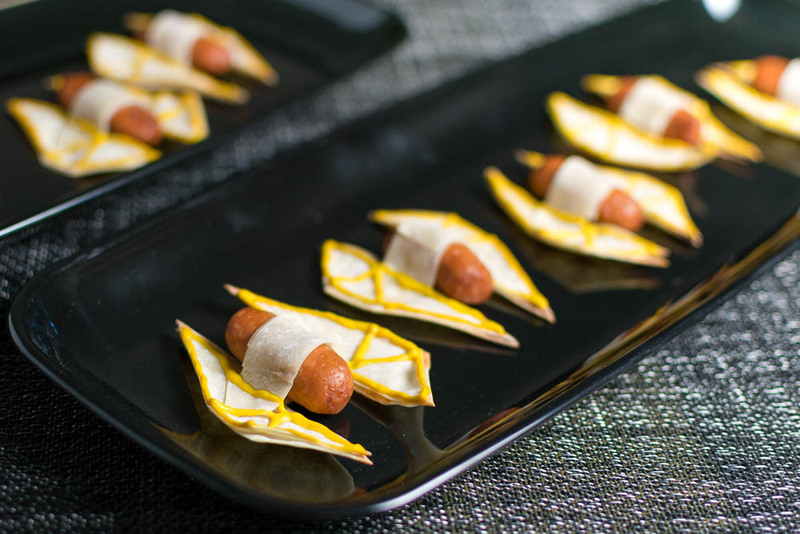 TIE Striker Appetizers– Lil Smokies and Super Bowl go together like peanut butter and jelly. Therefore, we couldn’t leave out our TIE Striker Appetizers. They are a bit more labor intensive but so worth it. 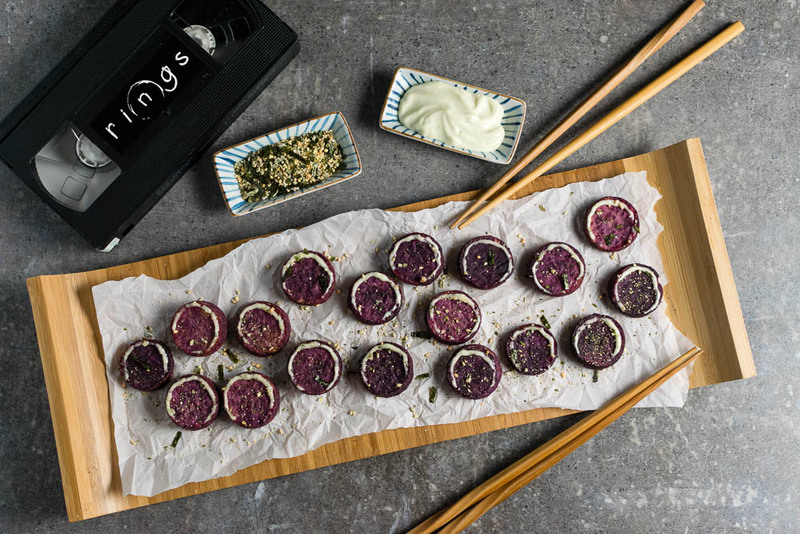 Samara’s Sweet Potatoes– How do you make potato skins geeky? You don’t! Our Samara’s Sweet Potatoes will be a welcome change of pace at the snack table! 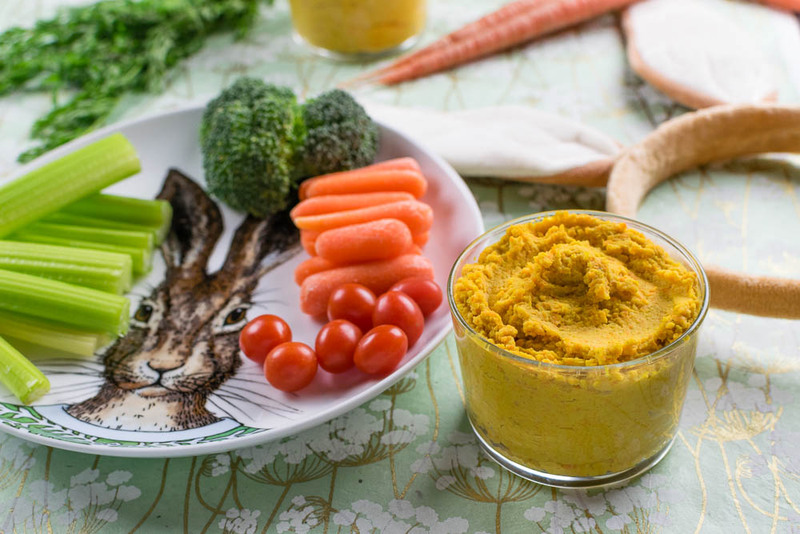 Curry Carrot Hummus– We wanted to throw in a vegan recipe just in case. Luckily, we recently did this recipe for Peter Rabbit and it’s really fantastic. The flavors of the curry and coconut cream will wow your crowd, vegan or not. Awesome Mix Trail Mix– Chips are an obvious snack at the big game. Heck, we love them and serve them. Looking for a little change? Our Guardian’s of the Galaxy Vol. 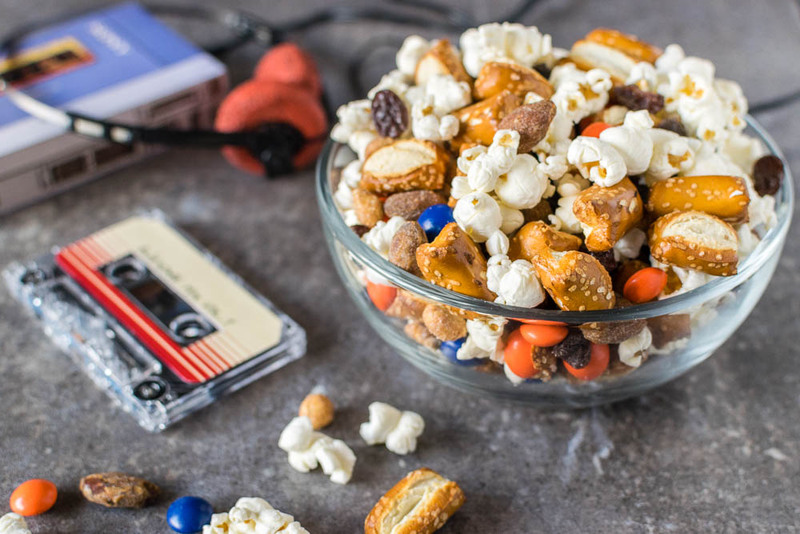 2 inspired Awesome Mix Trail Mix combines pretzels, popcorn and more. It’s well… Awesome! 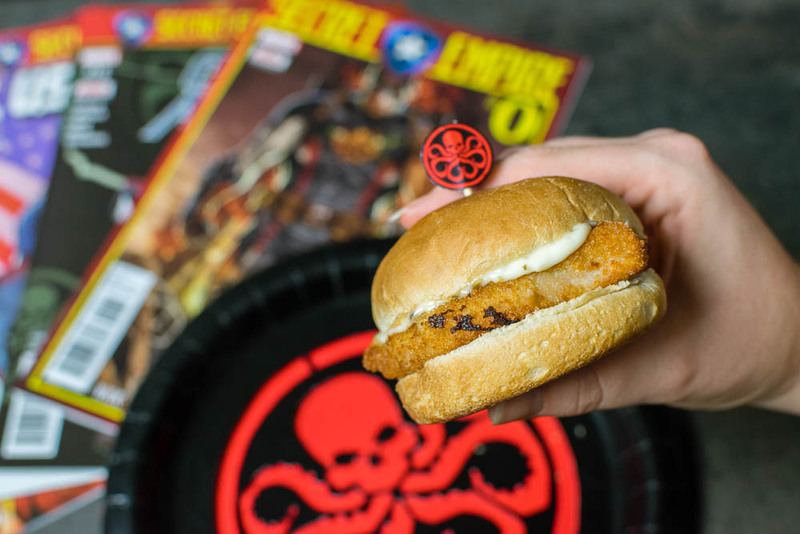 Hydra Schnitzel Sliders– Who doesn’t love to have something fried? Our Hydra Schnitzel Sliders are delightfully crispy but the tangy lemon caper aioli takes them to the next level! We hope that you try one or all of our recipes this Sunday! What do you do for Game Day? Do you serve something special at your Super Bowl Party? We’d love to hear all about it! Leave a comment below or tag us using the hashtag #GeekEats! Here’s hoping you have a fun filled party and may there be great commercials! More like awesome movie line-up snack list! I’m always willing to try out a new BBQ recipe. What a great spread, no doubt that the burgers will be a fan favorite not to mention the feta puff pastry stars. I wish I was invited =) Enjoy the game! Those TIE Striker apps look great! Definitely a geeky appetizer that would work well for game day. What a great round up of recipes for the game day! I am tempted to try the curry carrot hummus with some veggie sticks for my kids whereas I would be happy munching on those puff pastry stars. Oh my, literally everything on this list looks fantastic. If I went to a Super Bowl party, I would FOR SURE skip watching the game just to eat all these snacks! I am NOT a super bowl fan….but I AM a food lover. I would just be happy to eat the food…and pretend I was watching the game. It would be easy to do with this great collection of recipes. wow this is an incredible spread. I can eat it all! Would be a great collection for game day..!! To tell you the truth. I never understand sports so I just enjoy the food.! ha!! I’ve got to admit the puff pastry stars are my favorite although I would not pass at sampling all of them. I’m not a football fan but I am a fan of all the good food served that evening. All of your appetizers would be the stars of the night!! Winners for sure. Lots of fun recipes here for the big game…loving those sliders! This post made me so hungry! I love the sound of the Hydra Schnitzel Sliders and I’m not vegan but that curry carrot hummus sounds delicious! I do love a good hummus dip! Love this unique recipes for super bowl party. I wish I should see it before super bowl. No problem I can make it and enjoy even without super bowl. Feta and puff pastry star looks delicious along with carrot hummus dip. This list is perfect. The only reason I go to any superbowl party is for the snacks, and those feta pastry stars are calling my name!